Good plan! It's such a relief when we know our kids are in good daycare. Provincially, Albertans are looking to the New Democrats now that the Wild Rose option has folded. Federally, with the new riding boundaries, who knows what is in store for the New Democrats in Banff-Airdrie (formerly Wild Rose)?! I'm deeply saddened by the loss of Jack. If you are ready to celebrate the end of the campaign with NDP supporters in the Canmore area, send Anne Wilson a message at (403) 688-5325! If you need to contact me on E-Day, call 403-688-7855! Well, my cousins, the roads are horrible here in the mountains. I will have to cancel my doughnut appearance. I'll come out to the restaurant this weekend. Attention Morley...coming out to the rez tomorrow. I'll be at the band office around 11:30 to 1'ish. I'm bringing doughnuts. Tell your grandma's! I got an orange crush. I'm glad this issue is being promoted....well, in Spain....but still. All Candidates meeting on Wednesday April 27 @7:30pm at Cornerstone Theatre on 125 Kananaskis Way, moderated by Leslie Taylor. Ottawa is broken, and Jack Layton and your New Democrats are the team to fix it!!!! glad to hear people are getting out to the advance polls! I think I phased them with my verbal gymnastics...booyah. Ah, misinformation....the April 20th forum (tonight) is at the Max Bell Theatre at the Banff Centre in Banff...and it's 7:30. I'm still going to yell "Hash tag fail". Banff Forum on Wednesday April 20th at the Eric Harvie. I think it's 7. Then on to Airdrie at Bert Church High School (Home of the Klebber) on Thursday April 21. Come on out and support democracy. (and clap for me when I call the Conservatives on their hash tag fail. I'm excited that I am only expecting to lose by 31, 756 votes this year. You never know....you never know. Lots of grassroots movements starting up on line. Shitharperdid.com and projectdemocracy.ca are getting lots of hits, especially after Harper is begging for a majority. Jeff Horvath, the New Democratic Party (NDP) candidate for Wild Rose, said the government's focus should be on job creation. Great debate last night in Caroline, Alberta. Thank you to the folks who came out in support of democracy. A special thanks to the woman who is a Conservative but told me that I should be Prime Minister. Here's how the Cochrane sign crew works...they find beautiful scenery and then plant a sign! And to all my Stoney friends...spread the word and get your grandma's to vote on May 2! Spread the word, cousins! Hi all, hope you got my invite to this page and "liked" it. Please pass it on even if you're not in the riding of Wild Rose and even if you perhaps like me and maybe not my party...apparently this is how Obama did it....perhaps we can change Alberta? Yes we can? Why not? An African American in the US? How about an Ojibway in Alberta? Great discussion on the corporate tax rate question. 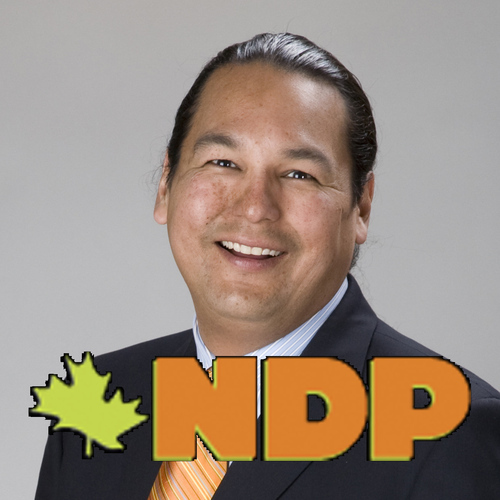 The NDP has a full slate of Alberta candidates in place for the next federal election. "I want to provide a positive alternative," the 38-year-old said. "Not everybody is as big on prisons, tax breaks for corporations and big banks and jet planes. "Something that seems to have been left by the wayside is climate change." It's a question of trust and leadership this time... “Harper went in there saying he would clean it up, but as Jack Layton says, ‘Ottawa is broken,’ ” said Horvath. In Alberta, remember, only New Democrats defeat Conservatives! #NDP #cdnpoli Let's cap credit card rates @ prime + 5%!!! My students at Canmore Collegiate are flourishing with the help of the Stoney Adventure Group Experience (SAGE). But native education on the Morley reserve is federally funded at a lower amount than provincial education. We need change! Thanks for the article Canmore Leader, it feels great to be done!